Several days ago we posted an entry, the new evangelization in Wisconsin, where we highlighted one Justin Lopina and the garbage he was peddling in one of his Novus Ordo homilies. 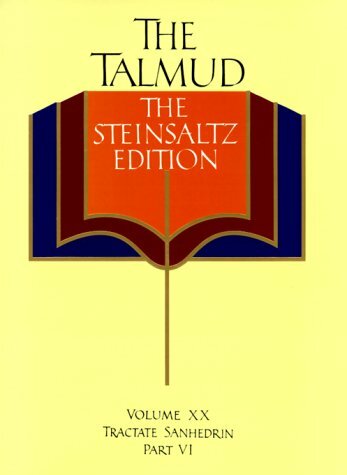 The garbage being the blasphemous Talmud. Apparently two people corrected him on youtube of his error and he didn't like it. Watch Justin's video reply below where he brings out a ‘brilliant’ orthodox rabbi to defend his behavior. Soon Call Me Jorge... will have another post on this occultic man-child. 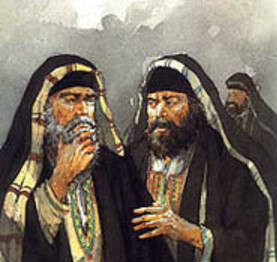 Justin is excited and believes that he has made the big-time because he upset two people because he honored the Talmud! If we were Justin we would be worried about not offending God. What does the Talmud say about Our Lord? 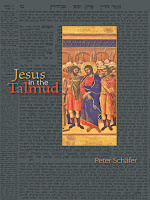 “Scattered throughout the Talmud, the founding document of rabbinic Judaism in late antiquity, can be found quite a few references to Jesus--and they're not flattering. 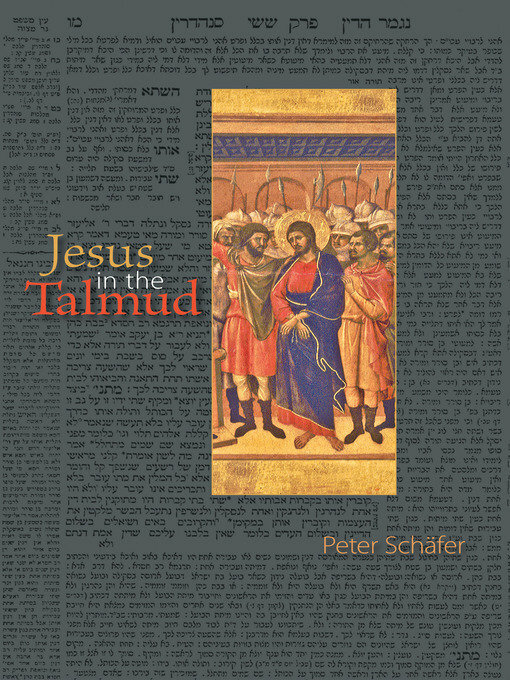 In this lucid, richly detailed, and accessible book, Peter Schäfer examines how the rabbis of the Talmud read, understood, and used the New Testament Jesus narrative to assert, ultimately, Judaism's superiority over Christianity. No prejudice or hatred in the Talmud towards Jesus the Christ, is there? We came upon this book over at Crux Now (Covering All Things Catholic). What a load of garbage! 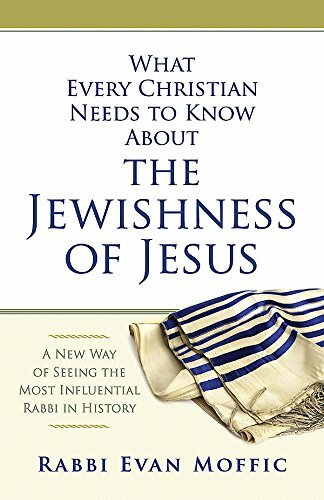 The rabbi who wrote the book says that Jesus didn't found a Church nor Christianity. This same rabbi also writes that Christians need to re-think Jesus with the help of the Talmudic rabbis. Crux Now, a purported Catholic website encourages their readership to buy and read the book. where he ate pizza with them. The flag of the People's Republic of China (also referred to as the “Five-star Red Flag”) is red in color to represent the communist revolution. The five yellow stars represent the unity of the Chinese people under the leadership of the Communist Party of China. are Don Feliciano Sanchez, and Don Tomas Ramirez. Juan Daniel Macias Villegas died on 18 February 2016 at the age of 103 years in his native town of San Julián, Jalisco, Mexico. 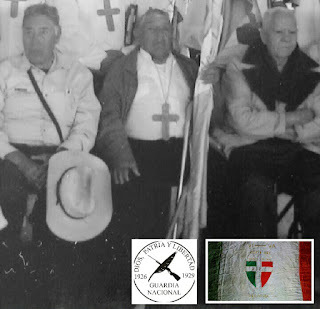 He began fighting with the ‘Cristeros’ at the age of 13 years. 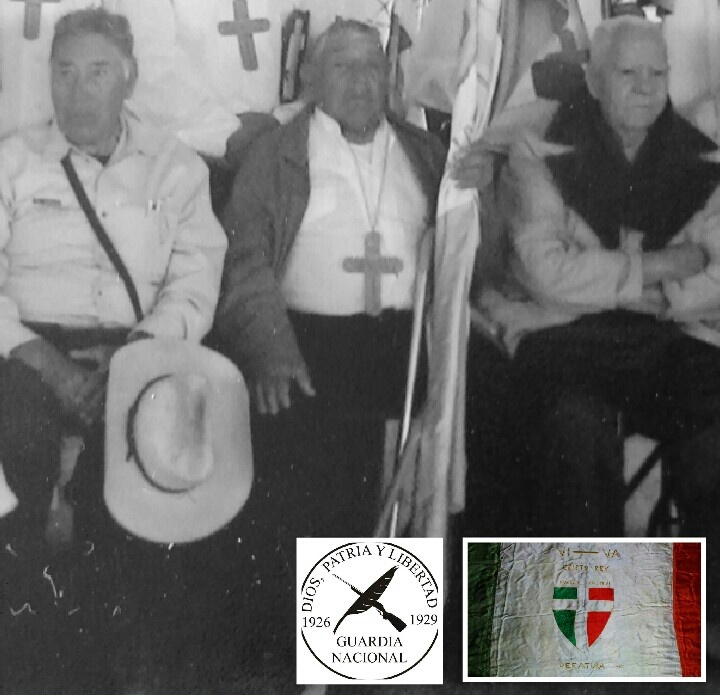 Don Macias was the last living soldier of the Cristero War. And may his soul and the souls of all the faithful departed, through the mercy of God, rest in peace. Amen. Below are excerpts and articles from the Jewish media on what a great man Justice Antonin Scalia was. We include this as an addendum to our earlier post, R.I.P. Antonin ‘Nino’ Gregory Scalia. As always the underlines in the articles are ours for emphasis. ...Scalia’s death prompted pundits to highlight his now-famous relationship with Jewish liberal justice Ruth Bader-Ginsburg. Despite their radically differing political philosophies, they remained close friends throughout their years on the court. They would attend operas together and their families would vacation together. Their off-the-bench friendship was so similar to a Romeo-Juliette bond that they even inspired an opera. Yet there is also this beautiful sense of, almost Talmudic, dialectic in the way the two engaged in pilpul (back and forth) to help sharpen one another’s legal arguments. They scarcely agreed, and yet they had a healthy, mutual respect for one another’s intellect. When Ginsburg was voted one of TIME’s 100 most influential people this past year, it was Scalia who wrote that he could “attest that her opinions are always thoroughly considered, always carefully crafted and almost always correct (which is to say we sometimes disagree).” Over the years, Bader Ginsburg would pay similar compliments to her judicial foil. As the best of Talmudic hevrutot (Jewish study groups), they used one another to sharpen each other’s arguments and were the better for it. And they did not let their political disagreements affect their personal relationship. In Jewish tradition we have our own Scalia and Ginsburg, who understood how to have a deep and healthy relationship with an intellectual or political opponent. They were named Hillel and Shammai. Living around the turn of the last century, Hillel and Shammai only disagreed five times, but the two set the precedent for the students from the Houses of Hillel and Shammai to disagree with one another a total of 316 times in rabbinic literature. Shammai’s school was generally viewed as more machmir, more stringent on matters of Jewish law, while Hillel’s was more meykil, lenient. In the end, we are told that in nearly every case, we are to side with the House of Hillel, who were viewed as more lenient. Yet, that is hardly the final word on Hillel and Shammai. 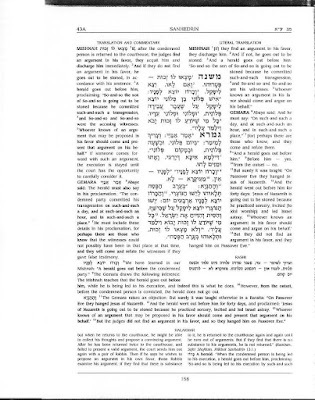 For all of their disagreements on matters of Jewish law, the Babylonian Talmud Yebamot 14b teaches that “though those forbade what others permitted, Beit Shammai nevertheless did not refrain from marrying women from the House of Hillel, nor did Beit Hillel refrain from marrying women from the families of Beit Shammai.” Even though the followers of the two factions rarely agreed, they too had a healthy respect for each other. The idea of Jewish peoplehood transcended politics. Watching the American political debates on television, I can only pray that someday the idea of American peoplehood will transcend politics. Rather than political, the differences currently feel like they are deeply personal: instead of saying he disagrees with her positions, Republican candidate Donald Trump called the Democratic Hillary Clinton, “in a certain way, evil”; and rather than sharpening one another in matters of policy, Trump and his rival for the GOP leadership Jeb Bush have gone back and forth calling one another “loser” and “jerk.” The relationship between Scalia and Ginsburg shows us a vision for a different direction that, instead of dividing the country, can bring us closer together. It is one where our sons and daughters would still marry, whether or not we disagree. Supreme Court Justice Ruth Bader Ginsburg (pictured with white fan) and Scalia (center) pose with members of the cast of "Ariadne auf Naxos" following a performance at the Washington Opera on Jan. 8, 1994. 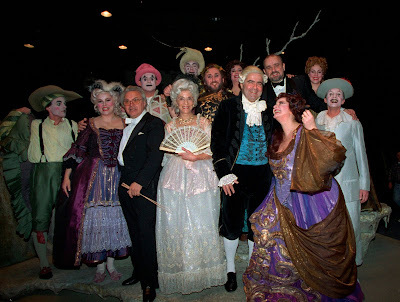 The justices, both opera lovers, appeared as extras during the performance. Toward the end of the opera Scalia/Ginsburg, tenor Scalia and soprano Ginsburg sing a duet: "We are different, we are one," different in our interpretation of written texts, one in our reverence for the Constitution and the institution we serve. Though dubbed 'bad for the Jews' for his stance on religion and state, the fiery Italian Catholic judge was a friend of the former Israeli Chief Justice, and brought 'chutzpah' into the Supreme Court. The late Justice Antonin Scalia, weighing on one of his final Supreme Court cases, made it quite clear where he stood on the issue of Jerusalem as Israel’s capital. When the ruling in Zivotofsky v. Kerry was issued last June, Scalia made the unusual move of reading his dissenting opinion out loud in court - a sign to court-watchers that a justice’s disagreement is particularly strong. That 6-3 decision struck down a law which would have allowed American citizens born in Jerusalem to list “Israel” as their birthplace on their U.S. passports instead of “Jerusalem.” The State Department had fought the law fiercely, defending its passport policy as necessary to maintain a U.S. position of neutrality on the question of Jerusalem’s sovereignty. It happened that Aliza Lewin, the attorney who represented 12-year-old Jerusalem-born Menachem Zivotofsky, was the daughter of attorney Nathan Lewin, the lawyer in a key decision Scalia participated in only a few years after he joined the Supreme Court, that rocked the American Jewish community - Allegheny v. ACLU in 1989. In that decision, the court’s majority, including Scalia, ruled that a Chanukah menorah, when placed alongside a Christmas tree displayed on government property, did not violate the U.S. constitution’s Establishment Clause, which forbids official government endorsement of a religion, and was permissible. That decision opened the doors to a plethora of Chabad-Lubavitch menorahs in public spaces across America every holiday season. Though Scalia’s positions warmed the heart of Chabad, the vast majority of American Jews, who are liberals, sharply disagreed with his church-state positions and wide berth for religion in public life and too-lax interpretation of the Establishment Clause. On a personal level, though, Scalia had a disarmingly warm connection with individual liberal Jews, most famously his Supreme Court colleague and ideological opponent Ruth Bader Ginsburg, whom he befriended when they worked together on the on the United States Court of Appeals for the D.C. Circuit, bonding over their shared love of opera and sparking a tradition of spending New Year’s Eve together with their respective families and friends. “As annoyed as you might be about his zinging dissent, he’s so utterly charming, so amusing, so sometimes outrageous, you can’t help but say, ‘I’m glad that he’s my friend or he’s my colleague,’” Ginsburg was quoted as saying of Scalia in the Washington Post. He also had a close relationship with former Israeli Chief Justice Aharon Barak, although the two disagreed sharply on fundamental principles of jurisprudence. Another impressive claim to fame for Scalia among the Jews was the fact that he - an Italian Catholic - turned out to be the first Supreme Court Justice to use the word “chutzpah,” which he included in a 1998 decision. One commentator attached greater meaning to Scalia’s introduction of the word into the Supreme Court’s vocabulary, saying that “although Justice Scalia felt the need to define the words ‘decency’ and ‘respect’ and called on the use of the American Heritage Dictionary to do so, he did not define ‘chutzpah,’ no doubt because the word is so obviously a part of the English lexicon. “What does increasing use of the word chutzpah signify?” the analysis continued. Thanks to Scalia, Chabad puts their menorahs up on government property. 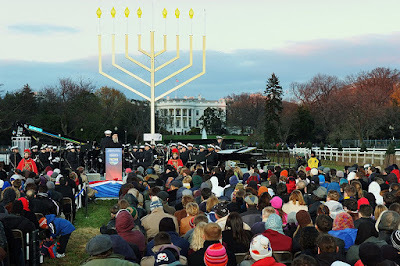 Here one of their menorahs is shown on the lawn of the White House. There is separation of Church & State in the United States but not of Synagogue & State which are joined at the hip. U.S. Supreme Court Justice Antonin Scalia, who passed away on Feb. 13 at the age of 79, is being remembered as a champion of freedom of religious expression with a deep appreciation for Jewish law, who was a thoughtful and enthusiastic participant in legal symposia on Jewish and American jurisprudence during his tenure on the court. “When there was no Jewish justice on the Supreme Court, I considered myself the Jewish justice,” Scalia once told legal scholar and attorneyNathan Lewin. Lewin, a friend and classmate of Scalia’s at Harvard Law School, had argued a number of cases before the Supreme Court, including County of Allegheny v. ACLU in 1989, when Scalia was part of the majority in a landmark ruling that a menorah erected by Chabad-Lubavitch emissaries could stand on public property. Lewin said that after Scalia’s appointment by President Ronald Reagan in 1986, he saw himself as “the guardian of the Jewish heritage within the Supreme Court” since no Jewish justice sat on the court between the resignation of Justice Abe Fortas in 1969 and the 1993 appointment of Ruth Bader Ginsburg by President Bill Clinton. Although diametrically opposed on most legal issues, Ginsburg recalled that she and Scalia remained “best friends” during more than 20 years of working together. In later years, Even-Israel (Steinsaltz) and Scalia would participate in a number of joint symposia on Jewish and civil law, including a 2014 dialogue at the Museum of Jewish Heritage in New York. 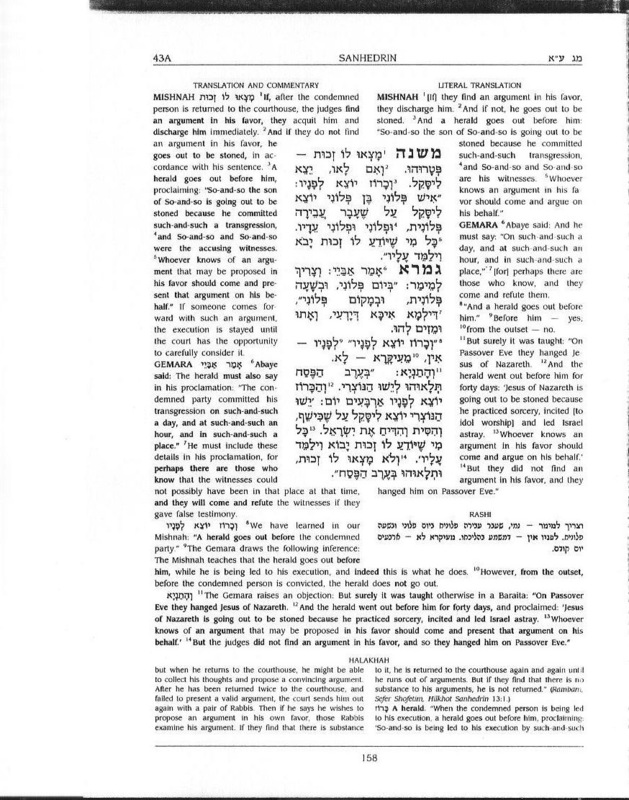 As part of the 1995 symposium, Scalia began the main session with a story of the Baal Shem Tov, the founder of the Chassidic movement, recalled event organizer Rabbi Dovid Eliezrie, director of the North County ChabadCenter in Southern California. “He arrived with a profound sense of inquiry and came to understand the unique dynamics of Jewish law. It was rooted in his deep sense of intellectual curiosity,” said Eliezrie. Rabbi Nachman Levine, an academic and educator who attended the symposium, recalled that true to his reputation, Scalia was “very funny” and made it a point to speak in a booming baritone so that everyone could hear him during Shabbat, when there were no microphones as they could not be used by Jewish participants. Levine recalled that since Scalia’s approach to constitutional law was rooted in understanding and not tampering with the original intent of its founders, a fair amount of discussion centered around the Oven of Akhnai. 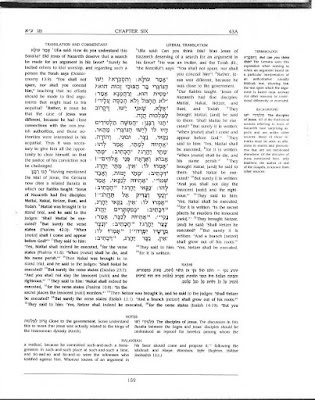 In this Talmudic lesson, the sages determined that even though miracles and heavenly voices supported the opinion of one rabbi, the final law followed the rule of the majority of sages. “He was very clearly familiar with the story and how this Jewish legal principle of majority rule among expert judges—and not even Divine signs—serves as the foundation for Jewish jurisprudence,” said Levine. “What if one person saw that everyone voted guilty, and he holds that the accused is innocent? Maybe he should vote guilty to get the guy acquitted?” mused Scalia. “He was so quick!” said Levine. In 2002, Scalia spoke at the National Institute of Jewish Law’s inaugural event at the Supreme Court in Washington, D.C. 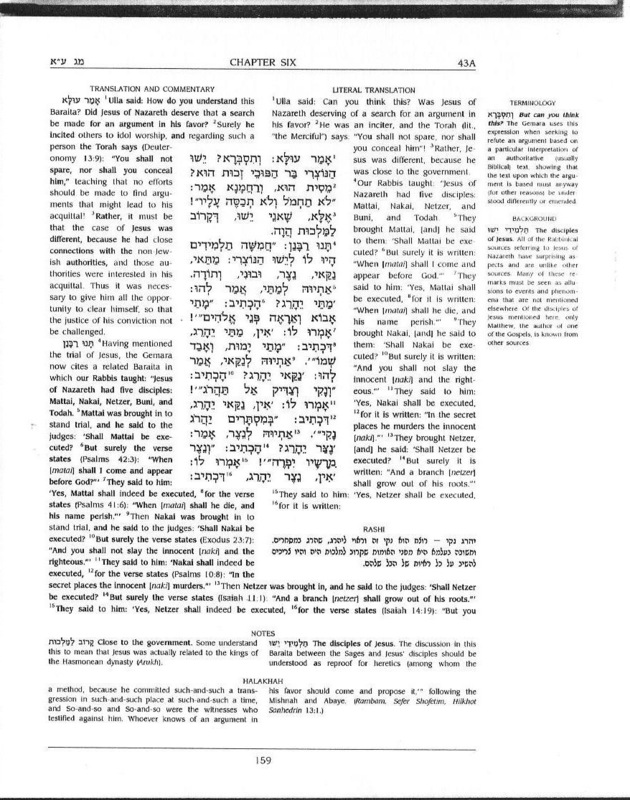 Rabbi Nosson Gurary, director of the Chabad House of Buffalo, N.Y., who then was a professor at the University of Buffalo Law School, recalled at the time speaking to Scalia about the importance of American jurists’ studying other systems, especially one as richly developed as Jewish law. “Knowledge of another legal system helped him to understand [the U.S. legal] system better,” said Gurary. 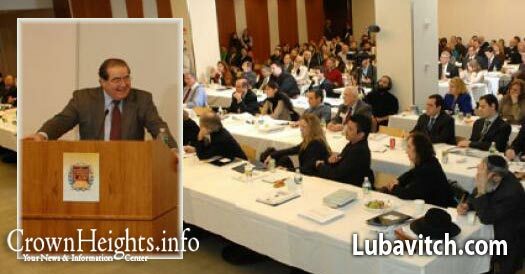 In 2009, Scalia participated in a daylong conference of the Institute of American and Talmudic Law, held at Chabad Lubavitch of Midtown Manhattan and chaired by Lewin and the dean of the institute, RabbiShlomo Yaffe. In a session on “The Right to Privacy and Individual Liberties From Ancient Times to the Cyberspace Age,” Scalia argued that while there is not necessarily a constitutionally guaranteed right to privacy that protects every detail of a person’s life from being published on the Internet or elsewhere, that freedom should be used responsibly. “The American right to privacy is a complex and obscure right that the judiciary should tread lightly when analyzing,” Scalia suggested. The justice system, he declared, is meant only to define the rights specifically declared in the Constitution and, if need be, to decide whether the legislature overreached in its interpretation of America’s foundational document of governance. Scalia, who was married for 56 years and the father of nine children, was remembered by Lewin and Even-Israel (Steinsaltz) as a warm and engaging individual. “He and his wife were guests in our sukkah,” recalls Lewin, “and he was kind enough to meet with law-school classes I brought to Washington to hear Supreme Court arguments. Lewin said Scalia would readily accept recommendations to address Orthodox Jewish gatherings, such as colloquia run by Chabad; sessions and dinners with Agudath Israel of America; and a mass meeting at YeshivaUniversity, where he and Lewin discussed current issues of constitutional law and public policy. 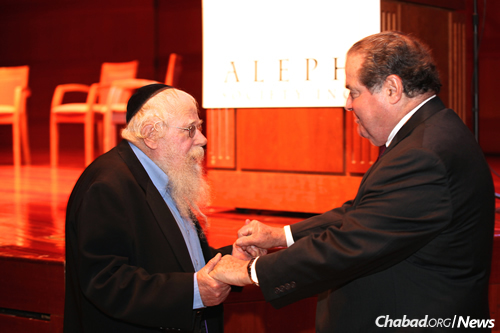 Chabad loved Scalia and Scalia loved Chabad! Justin Lopina starts talking about the Talmud at 3 minutes 50 seconds mark in the video. He totally (whether knowingly or not) misrepresents what the Talmud is and states. 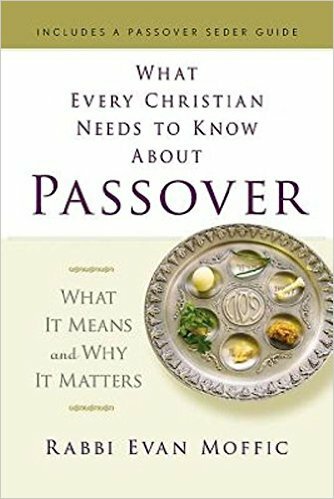 Why even bring up the Talmud when the homily is supposed to be about Christ's first miracle at the Wedding Feast of Cana? Nope, we didn't make this up. After much consideration and deliberation Msgr. 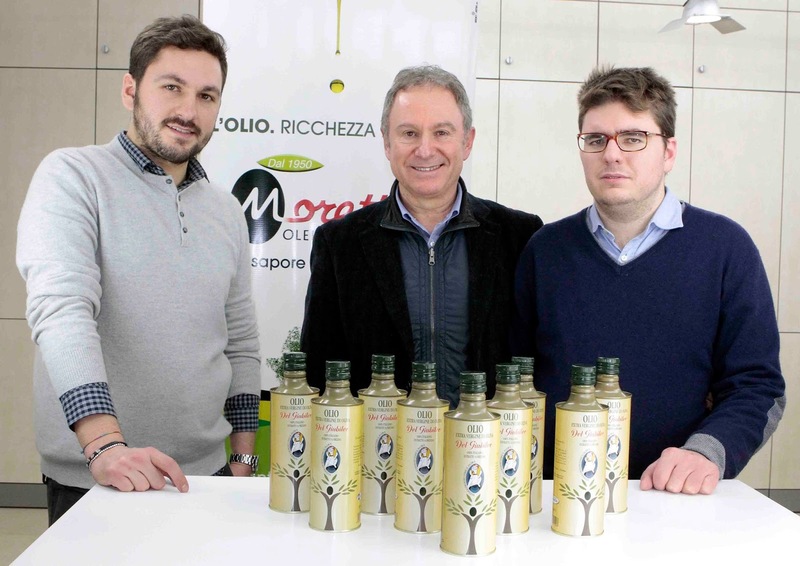 Rino Fisichella awarded a contract to Oleificio Morettini to produce the official olive oil of the Jubilee. The idea behind this is that pilgrims coming to Rome for the Jubilee Year will need an olive oil and since they are not familiar with Italy, why not have an olive oil with the Year of Mercy seal on it so they know they are purchasing a quality product. 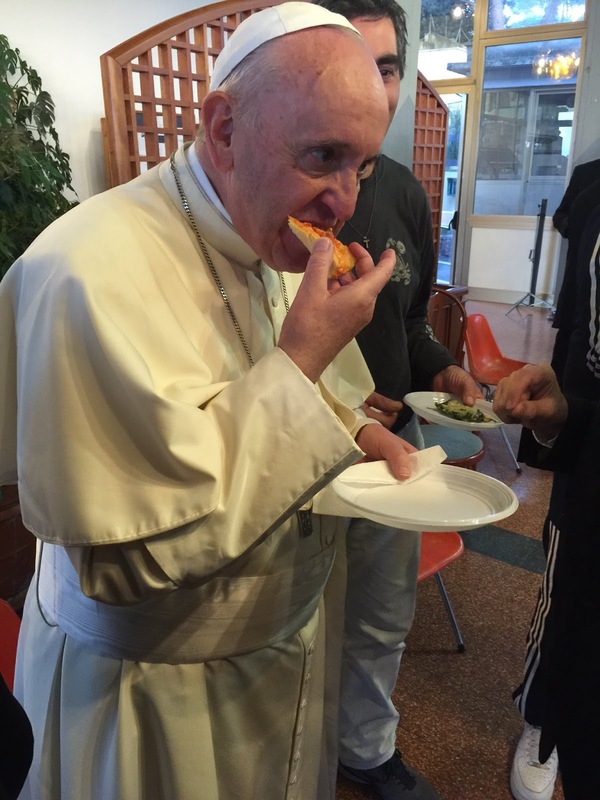 The olive oil will also be served at all meals in the Vatican City. Oleificio Morettini is a family owned firm which has been producing olive oil since 1950. Notice the design on the bottle is an olive tree which takes the stylized form of a pseudo-crucifix. No word on how much, if any money passed hands to make this deal happen. Secondly, that statement, that declaration about Ukraine. When I read this, I was a little bit worried because it was Sviatoslav Schevchuk who said that the Ukrainian people, some Ukrainians, also many Ukrainians felt disappointed and betrayed. I know Sviatoslav very well. In Buenos Aires, we worked together for four years. When he was elected — at 42 years old, eh, good man — he was elected major archbishop, He came back to Buenos Aires to get his things. He came to me and he gave me an icon — little like this — of Our Lady of Tenderness. And he told me, “This has accompanied me my entire life. I want to leave it to you who accompanied me over the last four years. It’s one of the few things I had brought from Buenos Aires and I keep it on my desk.” That is, he’s a man whom I respect and also familiarity. We use “tu” with each other(Editor’s note: “tu” is the informal way of addressing someone in Italian — they speak as friends)and so on. Francis is the World Champion of what?